The R165B Flat Arm Basketweave Patio Chaise Lounge is the perfect upgrade for properties that like to add the rich look and extra support of the cross strap design. Made from extruded aluminum with flat armrests for comfort, this commercial chaise lounge is perfect on the patio or around the pool. The high 16" seat height is perfect for sunbathers of all abilities. The double-wrapped 2 inch vinyls straps provide elegant support. 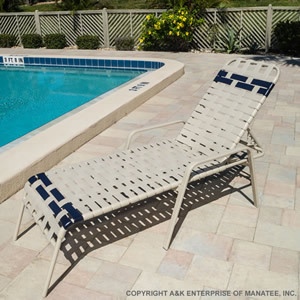 Customize the R165B Flat Arm Basketweave Patio Chaise Lounge for your property!